Posts tagged " bullying "
The Cañada College Core Curriculum: Bullying? Most of you, like me, have read how conservative speakers are being harassed and shut down on numerous college campuses. Sometimes violence is involved, such as at Berkeley, while other times “only” intimidation and disruption take place. Not surprisingly, when a society rewards bad behavior, we get more of it. Since the protesters have not been arrested and/or expelled following these events, suppression of conservative speech is increasing. My husband and I got our personal taste of this at Cañada College in San Mateo, CA, this past Tuesday night. 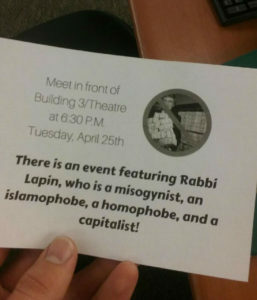 He was invited by students to give a speech about the morality of business and we soon found that the following notice, revealing the facility of language and depth of discourse one expects from college students, was circulating on campus. The students who had invited us assured us that security measures were being taken and that a large turnout was expected, though they were expecting some protestors.